Arthritis is a general term for the deterioration of a joint, and in the shoulder there are two joints which may be affected – the acromioclavicular joint or AC joint, which is where the clavicle (collarbone) meets the tip of the shoulder bone (acromion), and the glenohumeral or scapulothoracic joint where the humerus (larger arm bone) meets with the scapula (shoulder blade). 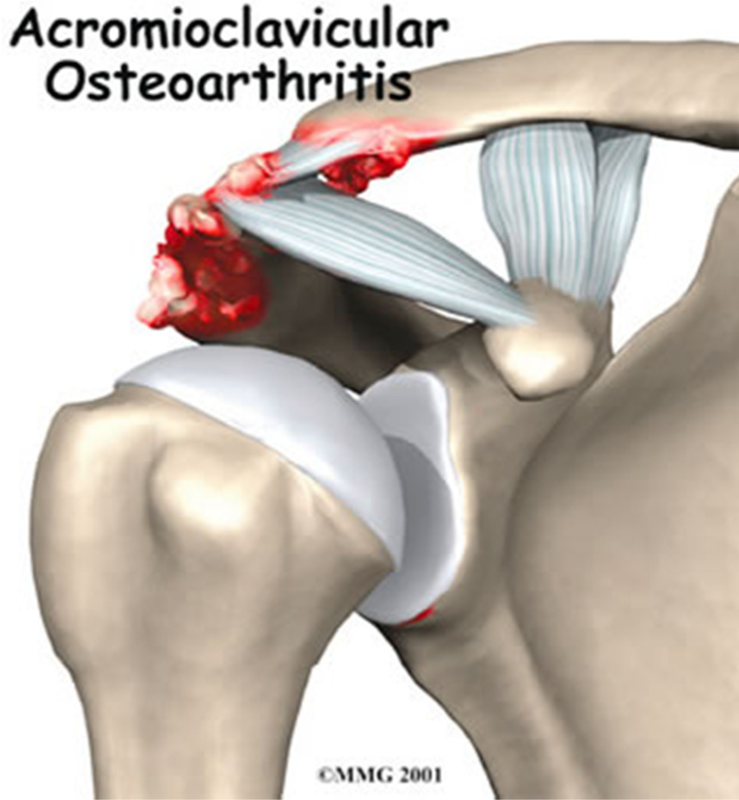 The principal cause of AC joint arthritis is use. As a person uses his/her arm and shoulder, stress is placed on the joint. This stress produces wear and tear on the cartilage, the cartilage becomes worn over time, and eventually arthritis of the joint may occur. 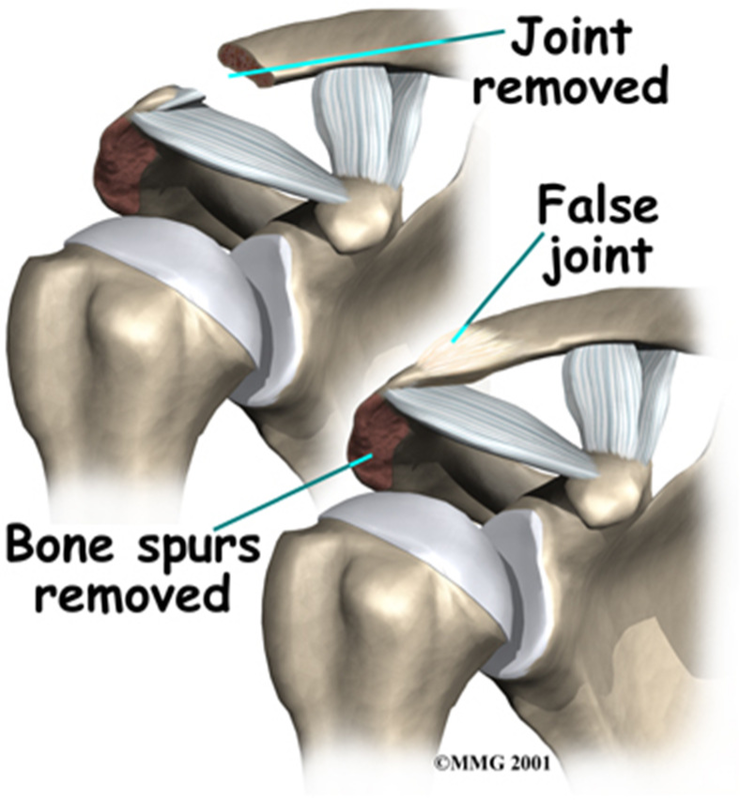 Another cause is an old injury to the AC joint, such as ACJ separation. Any activity that can put pressure on the joint, either normal or excessive, may eventually cause the arthritis condition. Persons who must use their arms for extended periods of time are susceptible to AC joint arthritis. Constant overhead lifting, such as is engaged in by weightlifters or construction workers who work overhead, can increase the incidence of the disease. Other susceptible individuals are athletes participating in contact sports or engaging in any activity which may result in a fall on the end of the shoulder. Any blunt force to the shoulder in the course of work, household activities, or accident may cause, over time, an osteoarthritic condition of the AC joint. Your surgeon will need a detailed medical history and will complete a thorough physical examination of the shoulder. To aid diagnosis, your doctor may inject a local anaesthetic directly into the joint. If the injection temporarily relieves the pain, this supports the diagnosis of AC joint arthritis. An X- ray will usually confirm the diagnosis with typical narrowing of the joint space. Initial nonsurgical treatment for AC joint osteoarthritis usually consists of rest and anti-inflammatory medications such as aspirin or ibuprofen. A rehabilitation program may be directed by a physiotherapist. If the pain does not resolve, an injection of cortisone into the joint may help. Cortisone is a strong medication that decreases inflammation and reduces pain. Cortisone’s effects are often temporary, but it can give very effective relief in the short term. If nonsurgical measures fail to relieve your pain, your doctor may recommend surgery. The most common procedure for AC joint osteoarthritis is resection arthroplasty. A resection arthroplasty involves removing a small portion of the end of the clavicle. This leaves a space between the acromion (the piece of the scapula that meets your shoulder) and the cut end of the clavicle, where the joint used to be. Your surgeon will take care not to remove too much of the end of the clavicle to prevent any damage to the ligaments holding the joint together. Usually only a small portion is removed, less than 1 cm. As your body heals, the joint is replaced by scar tissue. The scar tissue allows movement but stops the bone ends from rubbing together. 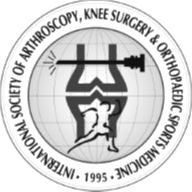 Today, it is more common to do this procedure using the arthroscope. An arthroscope is a slender tool with a tiny TV camera on the end. It lets the surgeon work in the joint through a very small incision. This may result in less damage to the normal tissues surrounding the joint, leading to faster healing and recovery. The older, open method of performing this operation is done by making a small incision, less than two inches long, over the AC joint. Rehabilitation plays a critical role in the surgical treatment of AC joint arthritis, and the pre-surgical condition of the shoulder muscles and tendons play the biggest role in surgery outcome. Exercises typically begin on the day after surgery with emphasis on moving the shoulder, wrist, and hand, with the focus of physiotherapy being on achieving full motion, but not strength. Strengthening exercises will begin at about twelve weeks from the time of surgery. This delay is necessary to allow the tissues to heal. Starting strengthening exercises too early may lead to complications. How can I prevent getting ACJ arthritis? program, you can keep or even improve joint flexibility. Rest only when joints are very painful.